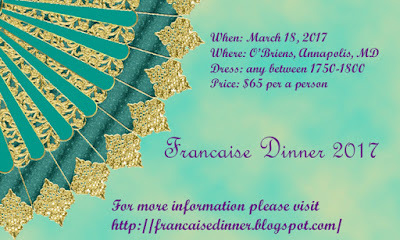 I would like to invite anyone who will happen to be anywhere near Maryland in the middle of March to the Francaise Dinner. 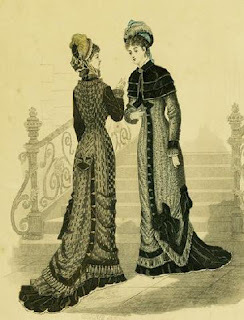 This is an annual event of feasting, friends, and fabulous finery. There is a lot more information on the link above or through the banner image posted. Please, feel free to contact me for any additional information. 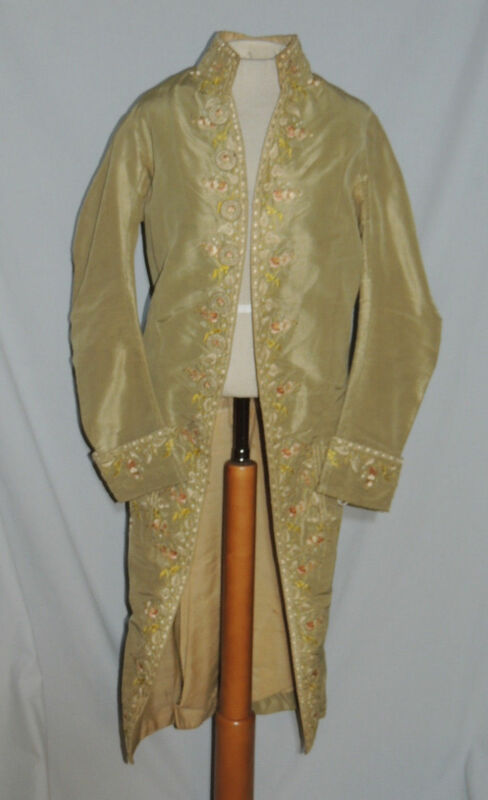 I want to also apologize for not being able to post as much as I would like. Graduate school (I'm going for my Masters in Digital Forensics) is eating up far more time than I would like. 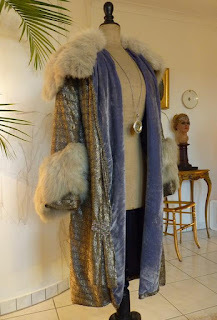 Hopefully, I will have more time to post in the next few days. 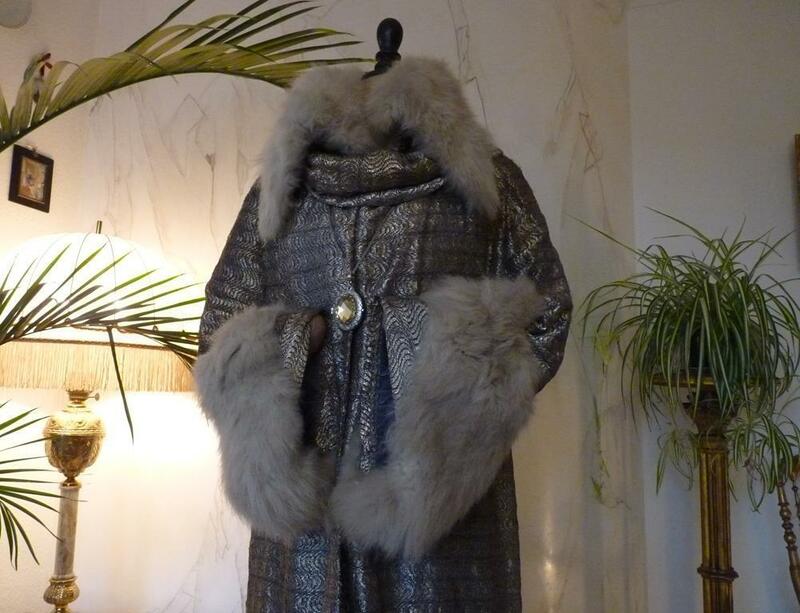 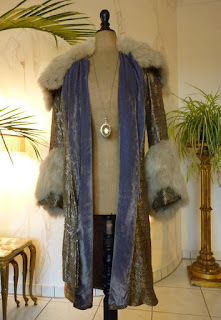 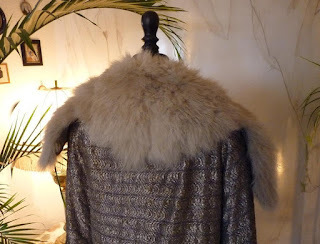 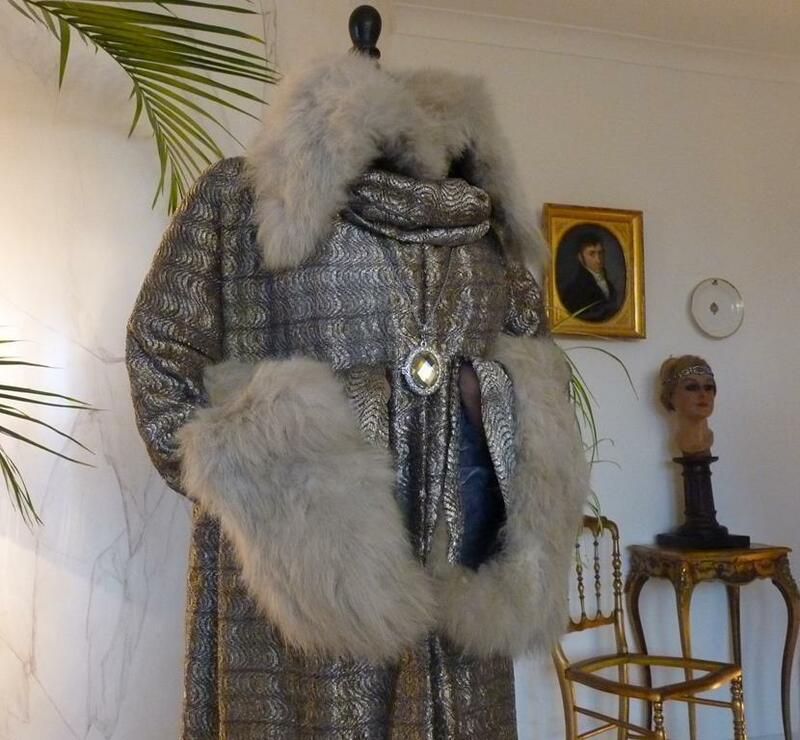 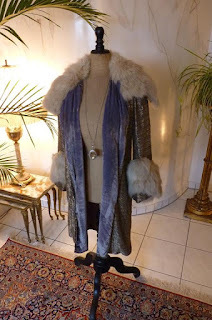 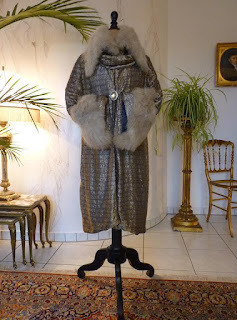 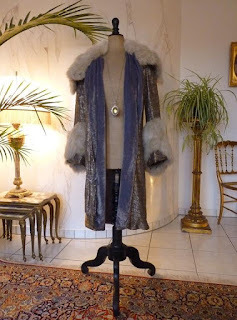 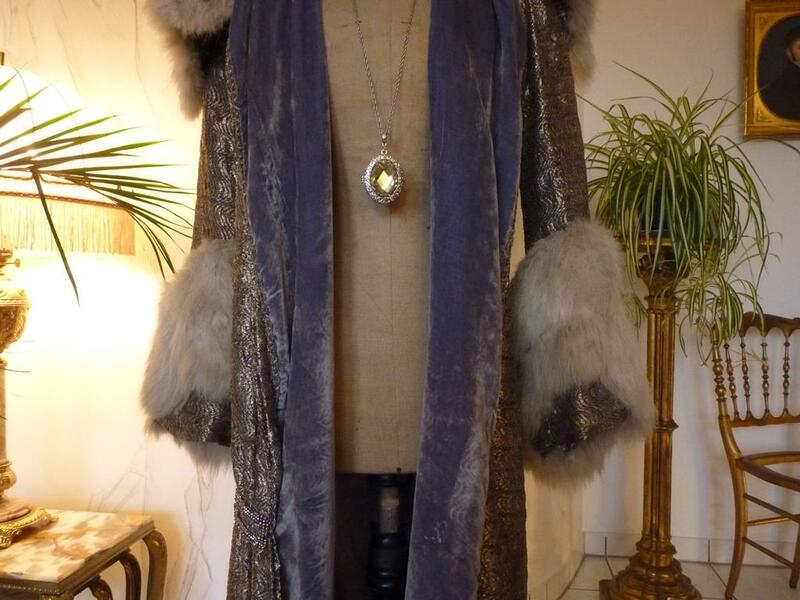 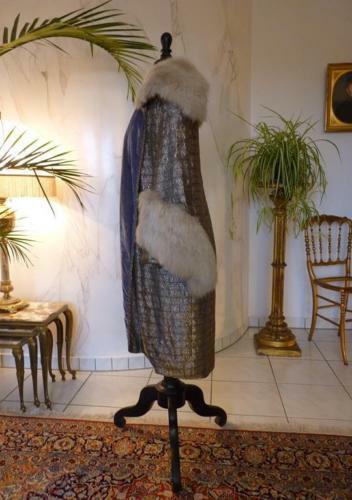 Extraordinary 1920s cocoon opera or evening coat with wide fur (white fox?) lapels to the collar. Pagoda sleeves trimmed at cuffs with fur. Gorgeous silver lamé. 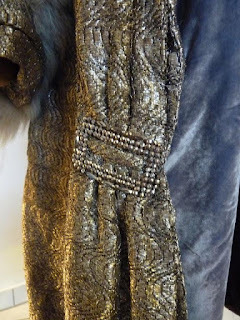 No closures. 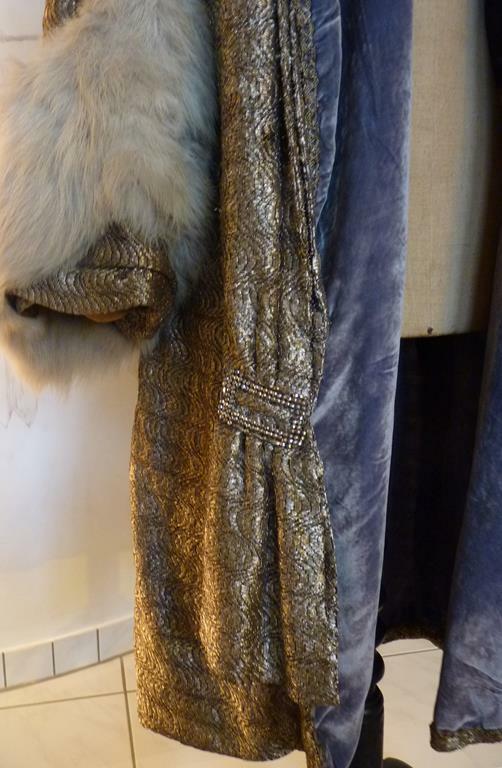 Classic flapper shape and silhouette. 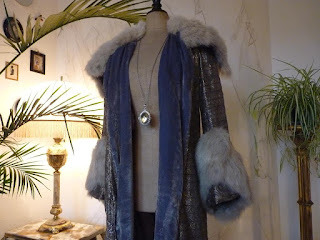 Collar can be worn popped if desired! 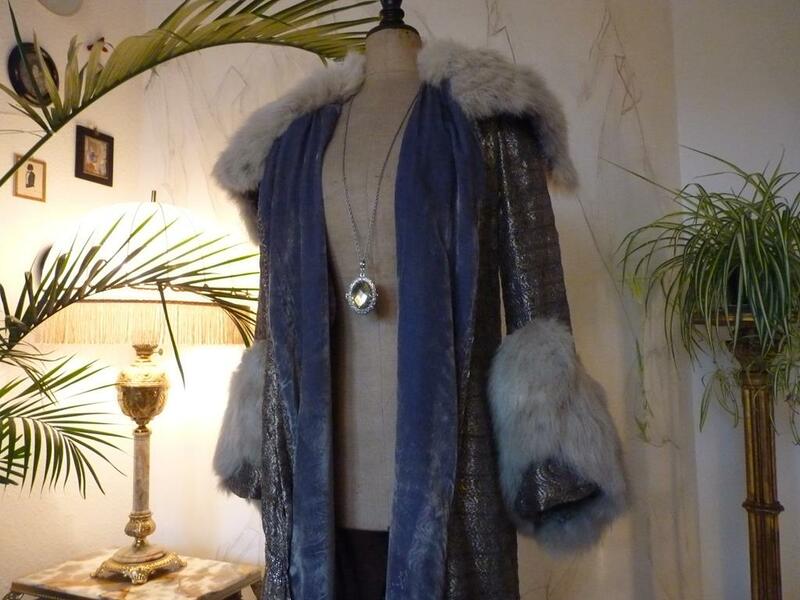 Lined in blue-grey velvet. Long shawl with claps for decoration and closure. Very good, wearable condition. 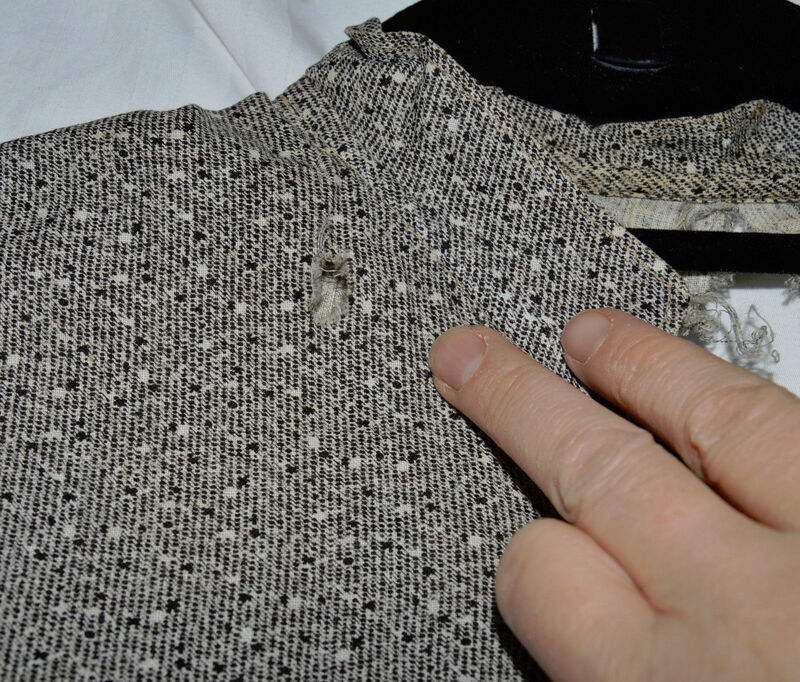 Only a few little holes, one on the backside of the coat, one on one sleeve und a few on the shawl. 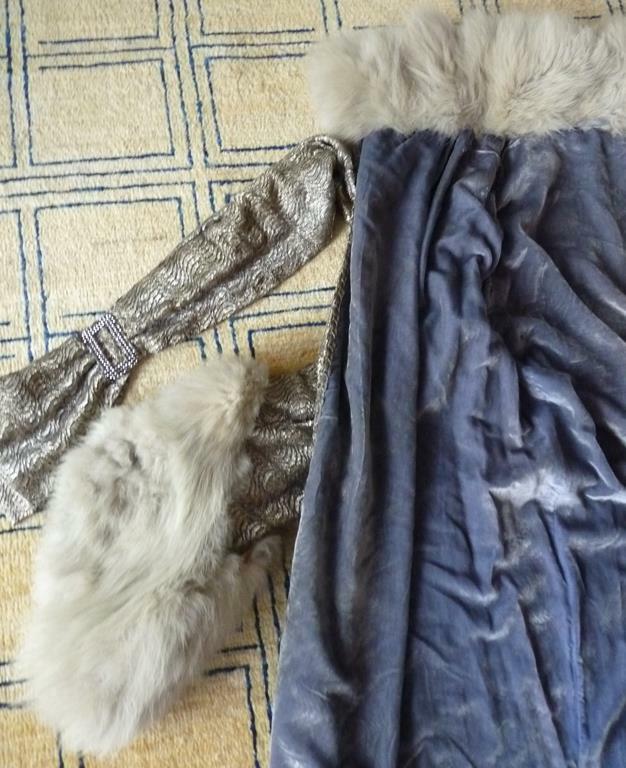 The fur looks a little bit dusty. 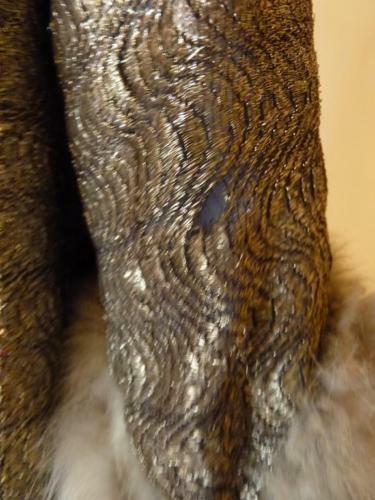 You’ll barely notice! 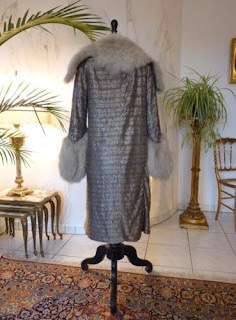 A beautiful historic piece. 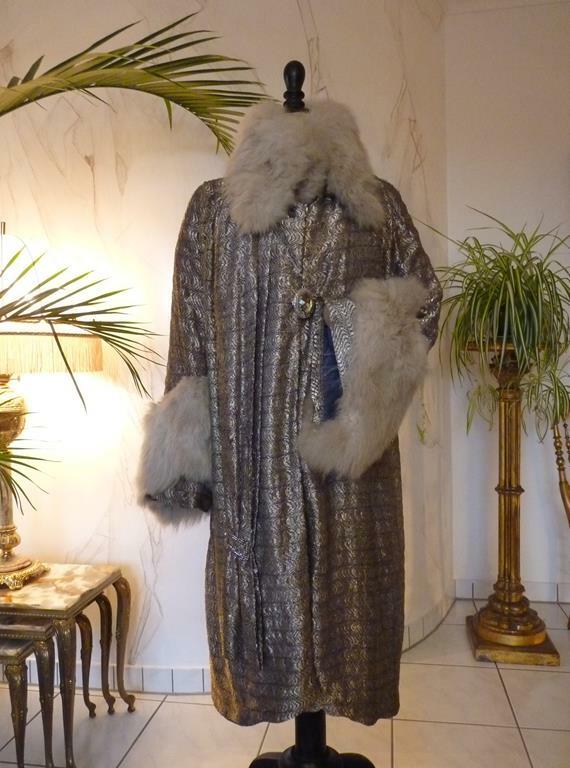 The decoration is not included. 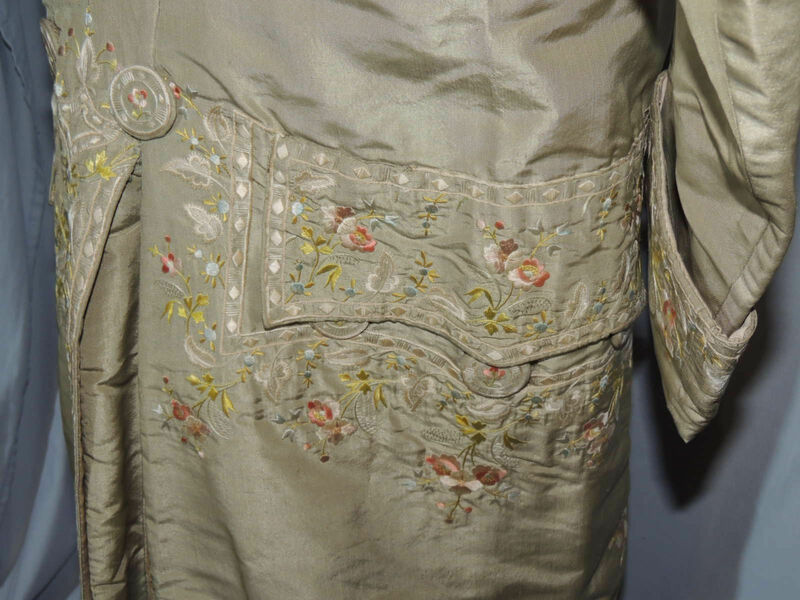 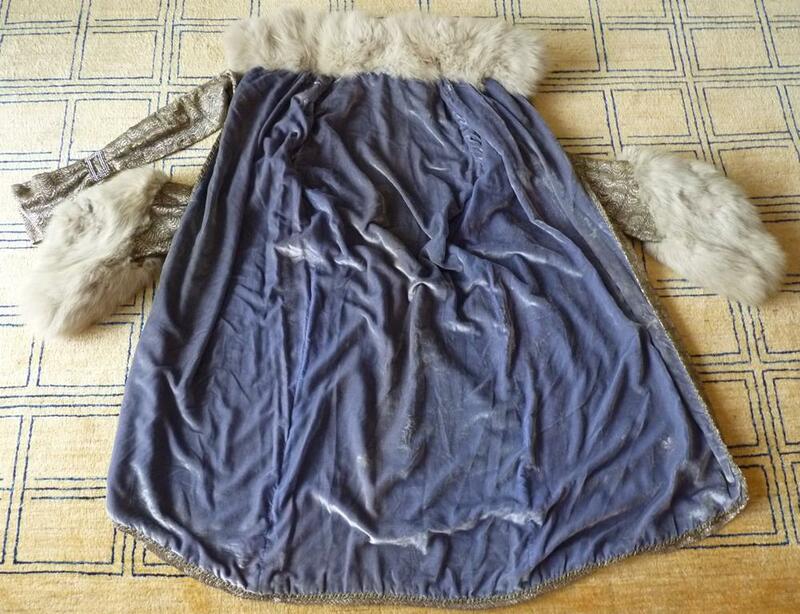 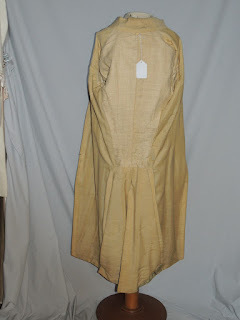 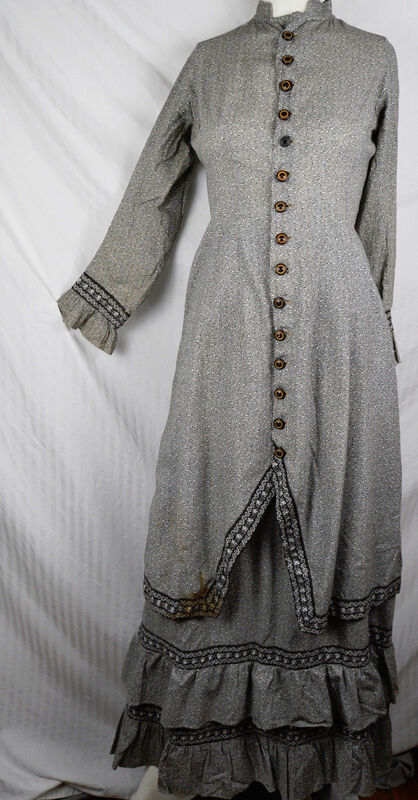 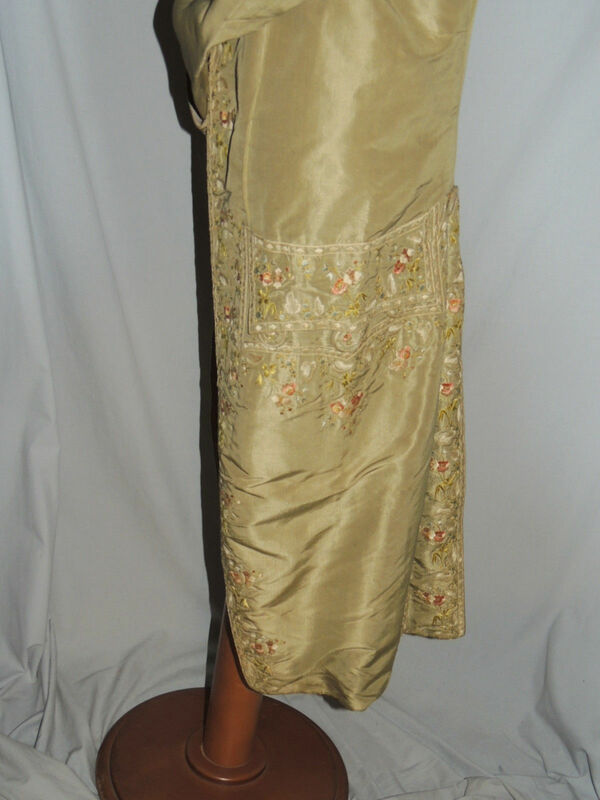 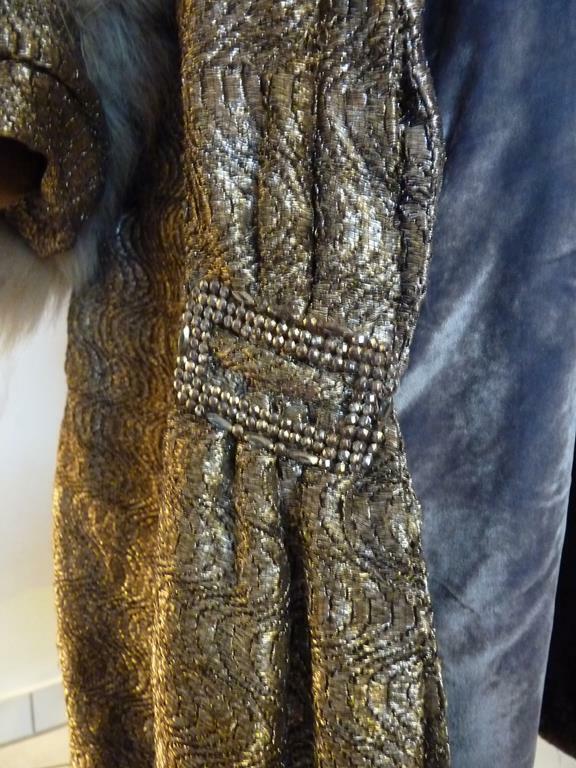 I found a whole bunch more photos of the coat off of Antique Gown that are way better. It's clearly the same room so I'm not sure why the seller put up the not so great photos on ebay. 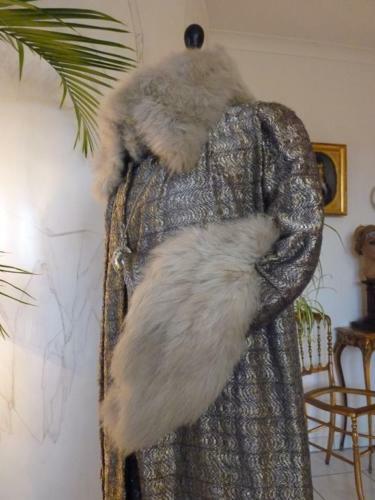 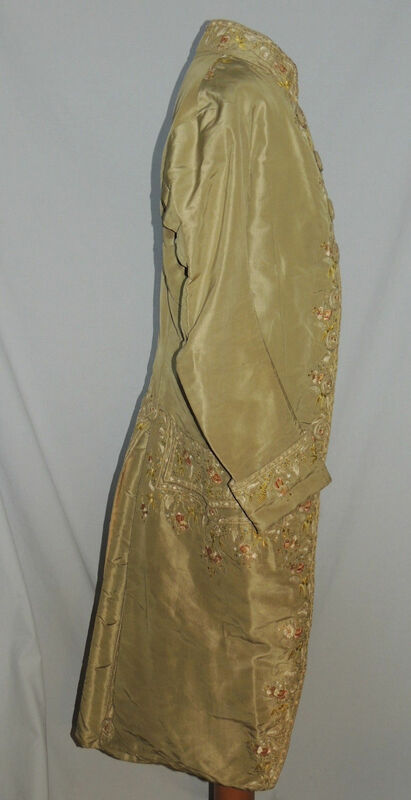 Very much a lovely 1920's coat. How's you like to wear something like that out this winter? 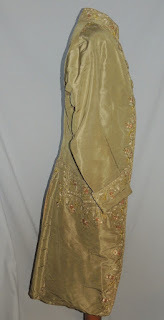 In fair - good preowned condition. 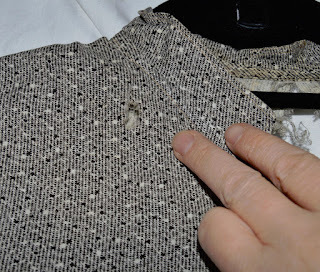 Stain at bottom of jacket, back of jacket needs repair, hole near neckline. 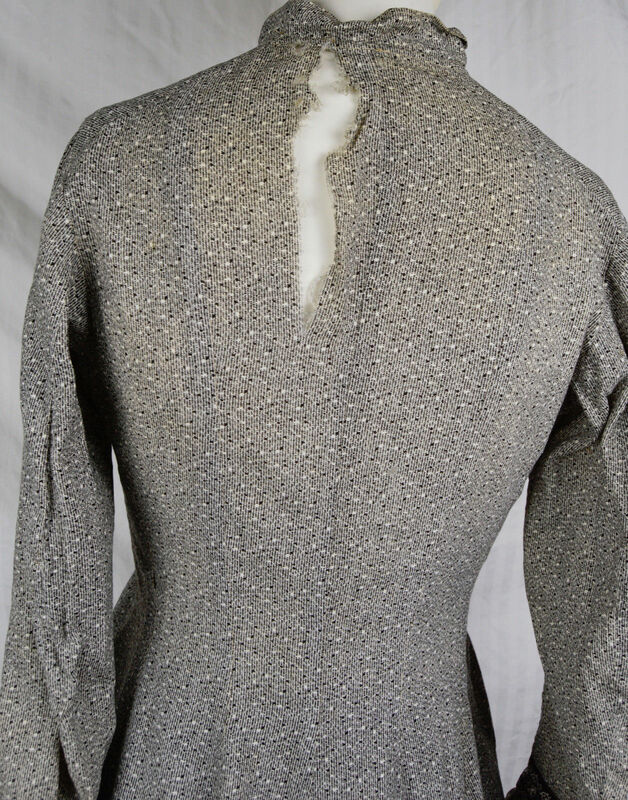 Jacket - Bust 33.5, waist 28, hip 44. 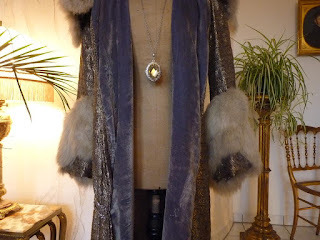 Although this is a simpler style, it's anything but boring. The dress looks to be wool and the weave itself is interesting. 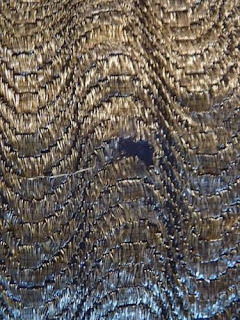 It looks like, at first, that the warp threads are white and black but with the black about every two or three warp thread. 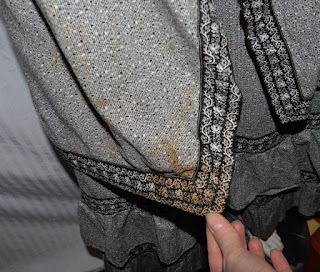 However, the polka dots show that isn't entirely the case. The trim at the edge of the dress (and on the skirt above the ruffles) is used more as a hem tape but to the outside. 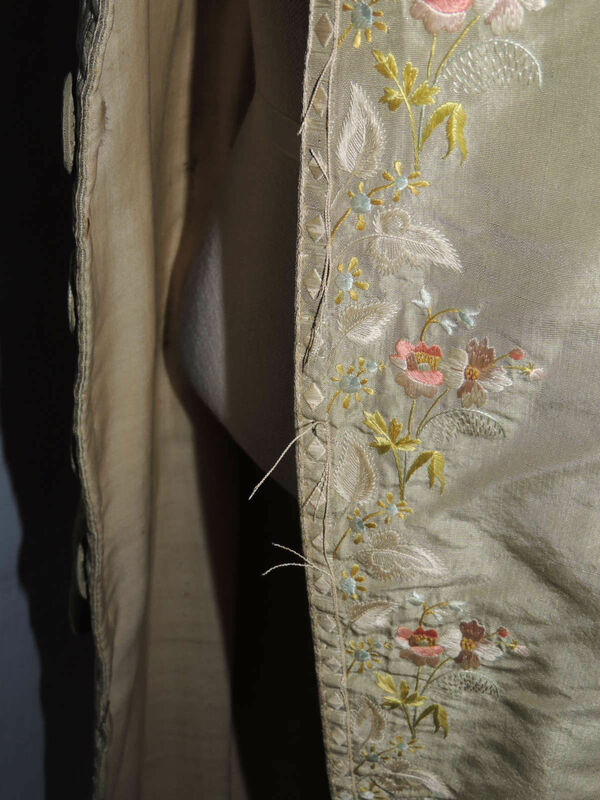 It was sewn, the wrong way, along the edge, and then folded up and sewn down against the material so it would show but also hide the raw edge. 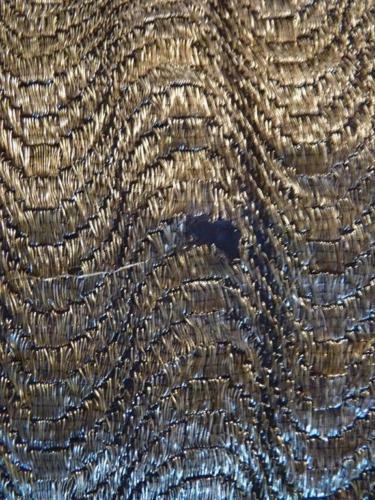 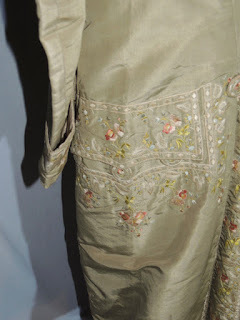 You can easily see the machine stitching on it in one of the photos. Based on the look of it, I'm pretty sure this was a lady's home made dress rather than a professionally made or catalogue bought dress. 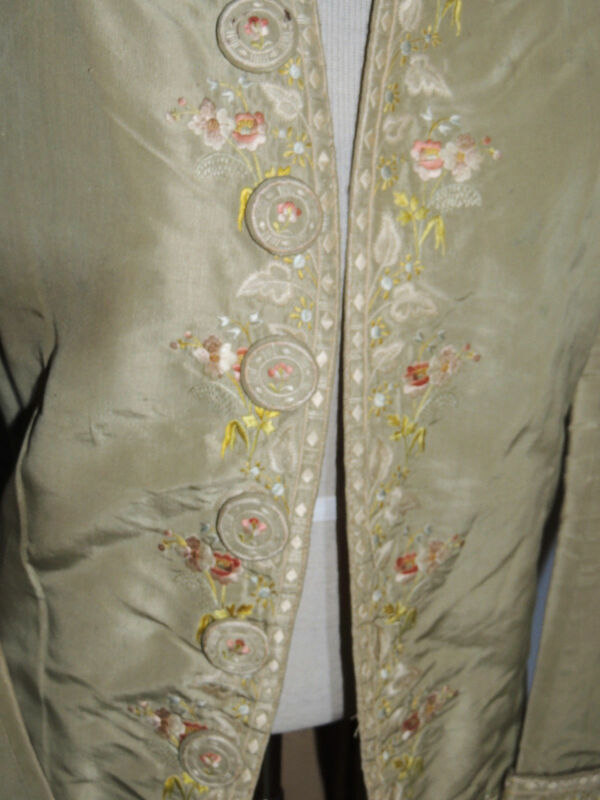 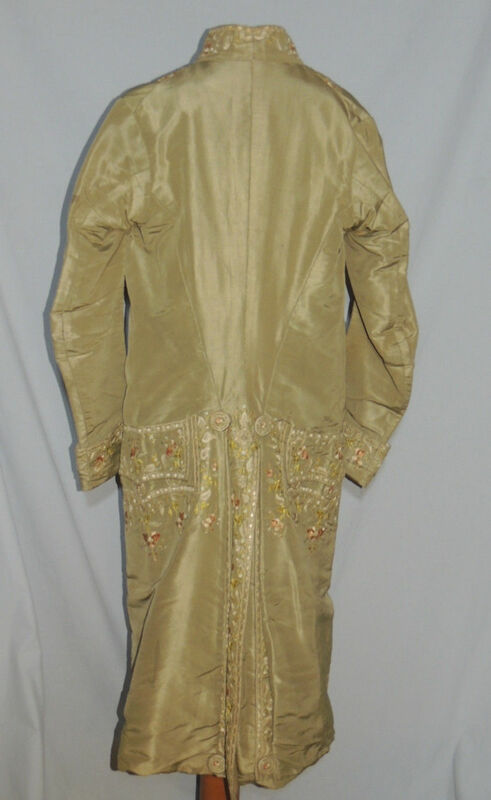 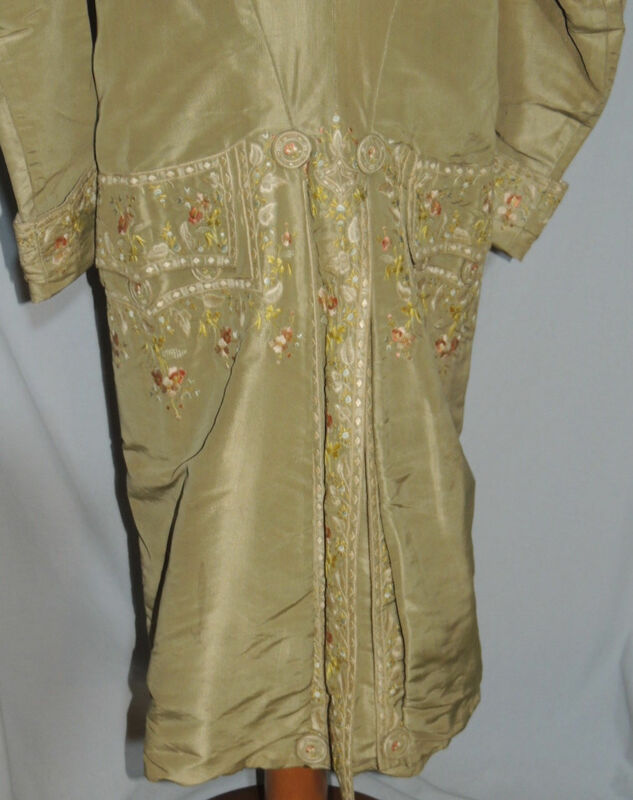 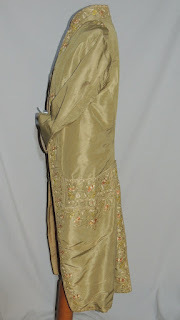 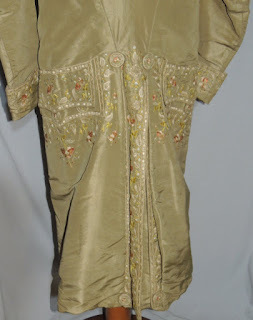 This gorgeous gents coat is made from a sage green silk and is heavily embroidered in ploychrome silk floss. 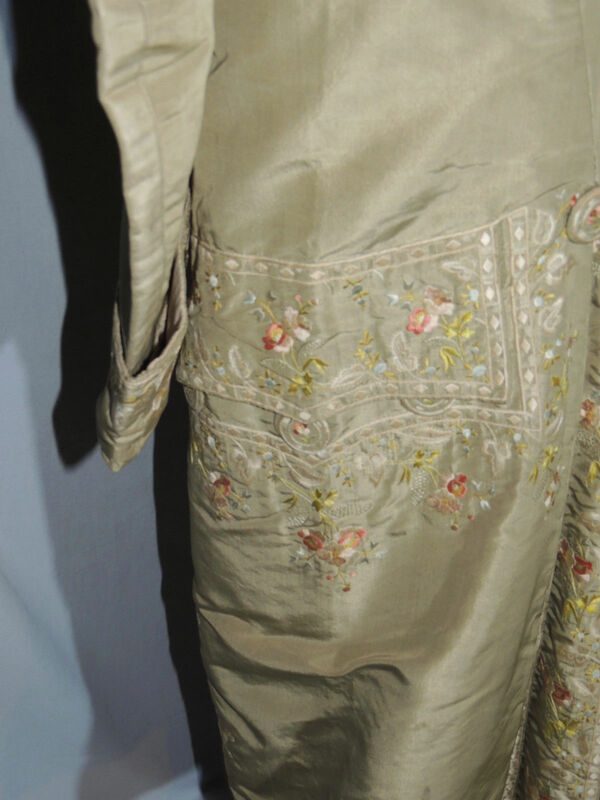 It has a stand up collar, oversized pockets under a deep scalloped flaps, back pleats, elaborate embroidery, and a wool and linen lining. 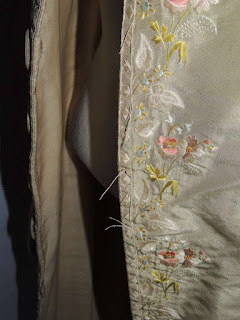 A few very minor spots or stains, minor holes in the wool lining De-accessioned from the Met. Museum of Art. It measures 36 inches around the chest, across the back shoulder is 16, sleeve is 23 and it's 45 inches long. 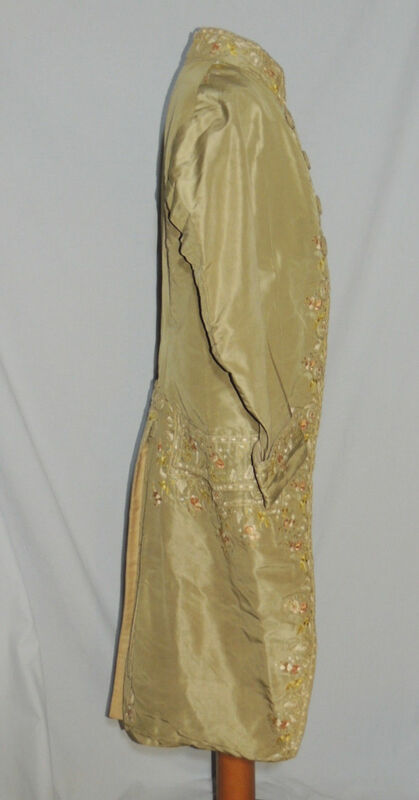 Excellent condition and a real beauty to add to a collection. 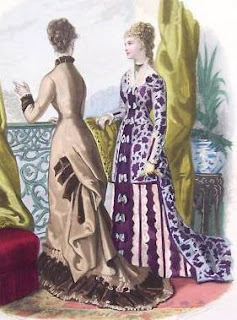 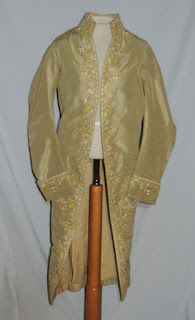 The frock coat: The embroidered frock coat was a popular theme in the late 18th century and, really, for court wear, well up into the 19th Century. Based on the cut of this one, I think it's more 1780's than 1770's.